BEIJING, Sept. 2 ,Chinese Premier Li Keqiang on Sunday met with Egyptian President Abdel-Fattah al-Sisi ahead of the 2018 Beijing Summit of the Forum on China-Africa Cooperation. 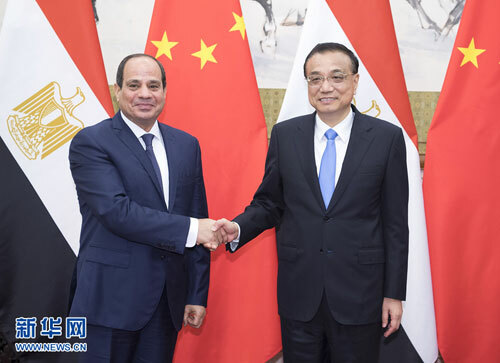 Li said China is willing to encourage its enterprises to invest in Egypt and to engage in cooperation in industrial capacity and processing trade via the Suez Canal industrial park for broader markets and mutual benefits, while noting that he hopes Egypt can provide preferential policies in taxes and other respects. Sisi welcomed the increase of investment by Chinese enterprises in Egypt, calling for efforts to make good use of Egypt's advantages in geographical location and the Suez Canal industrial park to jointly explore European, Middle East and African markets.